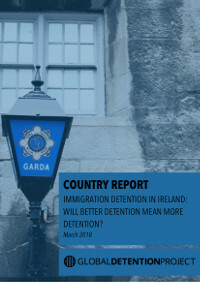 An international research organisation has published a new report exploring whether plans to build a new dedicated immigration detention facility in Ireland will result in more people being detained. The Global Detention Project is based in Geneva and reports on the human rights of detained migrants and asylum seekers around the world. Its latest report, focusing on Ireland, is titled Immigration Detention in Ireland: Will Better Detention Mean More Detention?. It highlights a “significant increase in the use of immigration detention” between 2015-16, and notes that Ireland and the UK are the only EU countries that do not implement the EU Returns Directive. The report states: “Importantly, because Ireland is not a state party to the EU Returns Directive, the practice of using penitentiaries for immigration purposes does not face the same legal challenges that it faces in other EU countries. The report also notes that plans to build a dedicated immigration detention centre at Dublin Airport have been repeatedly delayed, with the original plan to have the centre up and running by 2016. The new completion date of July 2018 is also unlikely to be achieved.